Assalamu alaikum wa rahmatullahi wa barakatuh. Eid mubarak! SubhaanAllaah Eid is already tomorrow! I hope that you all had a blessful Ramadan and have a happy Eid inshaaAllaah! I prepared Z for Eid by reading for him stories about two Eids. I read again from Salam - islamin polku 1-2. This picture is especially nice, because there kids play one game I played with my kids last year in Eid: Pin the tail on the donkey -game. From Handmade Beginnings I found a nice version of the game! Maybe we could try this in our party sister Ummu Abdillaah? These nice Arabic books about Eids I found from the library. This picture looks like Z driwing :). Kids would like to go to an amusement park, Linnanmäki, tomorrow inshaaAllaah, but we`ll see what kind of weather there is tomorrow. Now it`s raining a lot. We prepared some balloon animals for kids to play. It`s easy, but needs special balloons. Z and S love these! At first pump a ball, but leave a little bit empty. Then simply format the animal by rotating around a small parts of balloon. By leaving shorter or longer nose, ears etc. can make different kind of animals. ... and we prepared really simple cards from soft butterfly model and stickers. This time we didn`t use lots of time for cards or decoration. I used letter stickers also for paper mug. Normally I don`t like to use disposable items (I prefer even cloth diapers) but on Eid day I wanted to save dish :). Kids asked me to do a fish cake like that. 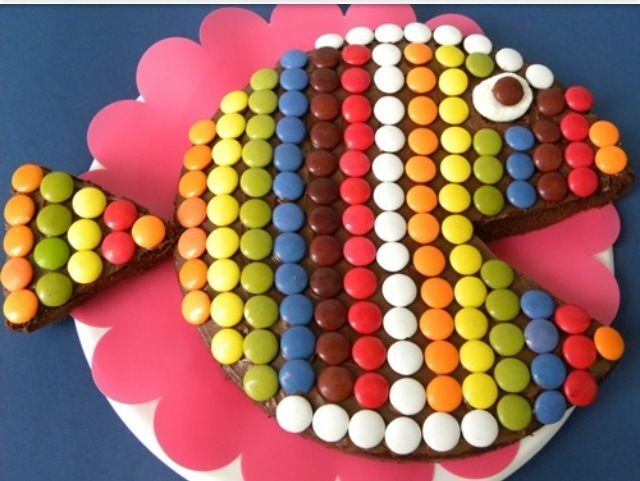 I tried to decorate kids`favorite cake (a sacher cake) as a fish by M&M:s.
I think that the result looks little funny, but kids liked it :). I added some M&M:s on the tray as a water and plants. tämä laite niitä talveksi pakastaa." It means that mum loves strawberries and this machine frozen them for winter. Answer is freezer and kids find the next hint from there. I wrote about ten hints and the last answer brings kids to the treasure. ... and there are inside a treasure: chokolade coins :)! I hope kids like that inshaaAllaah! I`ve done this kind of treasure hunt before too and kids liked it a lot! Sometimes I`ve done a treasure hunt outside and used photos from the environment as hints. It`s nice too. When kids went to sleep I prepared a present table for them as a suprise on the morning. On Eid day K, S and Z went on the morning to pray an Eid prayer with dad. K asked me to do pizza for lunch, so I prepared it for a while. K was able to fast all the Ramadan, except two days when he was little sick maaschaAllaah! And days were really long in Finland on Ramadan time subhaanAllaah. After eating and treassure hunt, which kids liked a lot, we went to Linnanmäki. Weather was great alhamdulillaah! I`ve told you before that I don`t like high places - I`m afraid about them. But yesterday I decided that now I overcome my fear and I went there with K, S and Z up the tower. And Alhamdulillaah it looked so beautiful from above! We found also a nice play ground from there for kids. Alhamdulillaah we all had nice time! I thank Allah for nice Ramadan and nice Eid! I hope for you all a really happy Eid!!! Our main thema for days 21-25 of Ramadan was Al Asma Al Husna. (Our plan can find again from Our Ramadan Study Plan.) We listened the names from ArabAcademy. It was nice, but some slower version would be better :). For the thema I made a thermometer with the most beautiful names. The idea is that kids try to repeat the names and then mark the place where they manage to repeat without mistakes. It can color, but in this time we used a sticker instead. By printing the names and using a colorful cardboard could prepare a beautiful thermometer, ours is again fast-and-without-a-printer-made :). And if have printer, it is easy to make an own thermometer for each child inshaaAllaah. We had this time only one. We also learned the meanings of the names in Finnish. I read stories for my kids about this thema too from Salam - islamin polku serie. When I was small my dad read for me a lot - also books which were meant for adults. Now it`s my turn to read for my children and I enjoy it Alhamdulillaah! S and K can ofcourse read by themselfes too and for some themes they`ve read alone too, but the feeling when all three kids are around me on the sofa and I read aloud is totally different! I like also discuss about important themes with my kids, because then I know, if they have understood or not. From here can find nice coloring pages about Allah`s most beautiful names! In this time we didn`t use the coloring pages, but maybe some of our readers can benefit from them inshaaAllaah. Aloitan Jumalan, laupiaan Armahtajan, nimeen. 1. Totisesti olemme ilmaissut sen (Koraanin) siunattuna yönä. 2. Siunattu yö on arvokkaampi kuin tuhat kuukautta. 3. Silloin laskeutuvat enkelit ja suuri henki Herransa käskyn mukaan kaikenlaisiin tehtäviin. 4. Silloin vallitsee rauha ja kestää aamunkoittoon saakka." I think that it`s also important to understand the meaning of the verses! I`ve heard that some kids can recite Qur`an, but don`t understand the meaning at all. I liked a lot sister Ummu Abdillaah`s idea about home made Qur`an holder! I made a miniature one for S´s doll. I used foil paper and tape, which I found from home. I made also a small "book" for the doll. Really small ones could be made for dollhouse too, but S has not a dollhouse any more. From here can find a nice Laylatul Qadr powerpoints and a bulletinboard! I got the address from sister Ummu Abdillaah! Thank You dear sister! For thema muslimcountries and mosques (our main thema on 27. day of Ramadan) I prepared two puzzles from ice cream sticks and two pictures of famous mosques (The Aqsa Mosque in Jerusalem and The Prophet Muhammad`s (SAAS) Mosque in Madinah. I found the idea for the puzzles from here. Please, be aware, that this blog is not "an islamic" one and it`s not written by a sister. I only wanted to introduce the idea, how can make simply puzzles from re-cycled materials. There are a good tutorial too! I`ve linked this kind of blogs before too, but I`ve wanted to introduce only a spesific idea, which I felt, would be useful. In this interval I have to add that also in some sisters` blogs, where I`ve linked, there can be some opinions which I don`t agree - I mean to link only the ideas which I feel useful, but it doesn`t always mean that I agree the whole contents of the blog! On the backround I added the name of the mosque. We discussed with the kids about muslim countries which we`ve been able to travel and mosques we`ve been visited. Kids favorites were Istanbul in Turkey and Algeria of course :). We read again Salam - islamin polku serie! We discovered again baby I`s earth ball too. In this time we tried to put note papers with the names of countries to right places, like that. I draw about this thema with Z for a big paper. When I was child, me and my brother taped many normal papers from back side as a one really big one and draw together. We choosed a thema and then both of us draw about it for the same paper. It was so nice especially outside in our garden in sunny days :). I got chance to discuss about our learned subjects with Z while drawing. The result is not so important in these kind of works :). For days 28-29 of Ramadan our main study thema was Basic information about Qur`an. Again we used Salam - islamin polku serie. If there is some Finnis speaking readers - I don`t know if we have any? - I can recommend this serie also for home! I ordered Salam - islamin polku 1-2 for my kids from Oph`s internet shop. Salam - islamin polku 3-4 I found from library. We learnt that Surat al Fatiha has another names too like fatihat ul kitab, Umm al Qur`an, suurat salat and saban min al mathani. I read for them also stories about Quraish and the people of the elephant. I`ve read aloud for the kids during Ramadan about 200-250 pages. Alhamdulillaah Z is also nowdays able to listen longer stories than before. He concentrates much more better than before alhamdulillaah! I know that he has not understood all we`ve studied during this Ramadan, but because K and S have also been at home for summer holiday I choosed this studying method this time. I think that Z has learnt too a lot inshaaAllaah. Of course some of our subjects have been too easy for S and K, but I think that revision is not a bag thing either. Some easiest activities I`ve done only with Z and older kids have also read alone by themselves. I`ve tried to give something for everyone. During Ramadan my husband has kept both Arabic and Qur`an lessons for the kids alhamdulillaah! For Z`s Arabic lessons I found from library Usborne`s book First hundred words in Arabic. This is easier than The Usborne`s book First thousand words in Arabic, which I ordered for Z (and by the way it was too in the library!). At first I liked the colorful pictures a lot! But in Islamic point of view I didn`t like that in some pictures a dog was for example in the kitchen and even at the table! Children should be explained that we can use this book for learning Arabic, but not for learnig manners etc. K told for me that the drawer only wanted to make pictures look funny, but for smaller children without understanding about Islamic manners, the pictures should be explained. And by the way in Finnish non-muslim families dogs are often able to come to home and even to kitchen and bed! So it`s important to explain for small children that as muslims we don`t let dogs to go everywhere! In many children`s books which are written by non-muslims there can be pictures or text which is opposite to our believings, so please watch out! Z got his 5th Teddy bear`s preschool book. In this book there is a nice thema: farm and forest animals. I like especially the cards where are animals and their babies! Them can be used for example for a memory game. Z started the book already: directly when he saw the book, he ran to take his pencils :)! Baby I was born in last Ramadan and he has started to walk by the help of sofa, bed, table or something like that some time ago Alhamdulillaah. He also likes to drive by a car like that. It`s Z`s one and his favorite too, but alhamdulillaah he lets baby I to drive too! Nowdays baby I is really active maaschaAllaah and I was SO happy when found Manduca from second hand couple of weeks ago with nice price Alhamdulillaah :). And he likes it! Now I can put him sometimes to Manduca while working at home, because I have not always time to supervise him. It`s also useful in some places where can`t go with strollers. Sometimes I`ve used it also when go to shopping. I can carry even Z by Manduca! He wanted to try too when saw baby I there and yes I can carry him too :)! When K was about 2,5 years old I sometimes carried him by a long sling. A nice post and nice pictures about baby wearing can find from here! SubhaanAllaah it`s already Eid-time soon! Again I feel like time has flied! I tell for you about our Eid preparations and Eid later inshaaAllaah. Here are some printable Eid cards which I found and liked, but can`t use by myself this time. Maybe some of our readers can benefit from them inshaaAllaah! I hope happy Eid for you all!